We are joining our friends from PBS Kid's Dinosaur Train to celebrate National Children’s Dental Health Month and Valentine's Day! As part of the Super Smile team we are helping to remind kids (and parents) to make oral health a priority this month... and always! The Jim Hensen Company sent us a super cool package earlier this week to help us kick off our celebration. a copy of the Little Golden Book Buddy’s Teeth. Once the package arrived it was ripped open and we watched our new Dinosaur Train: I Love Dinosaurs DVD right away followed by several readings of the Little Golden Book Buddy’s Teeth. 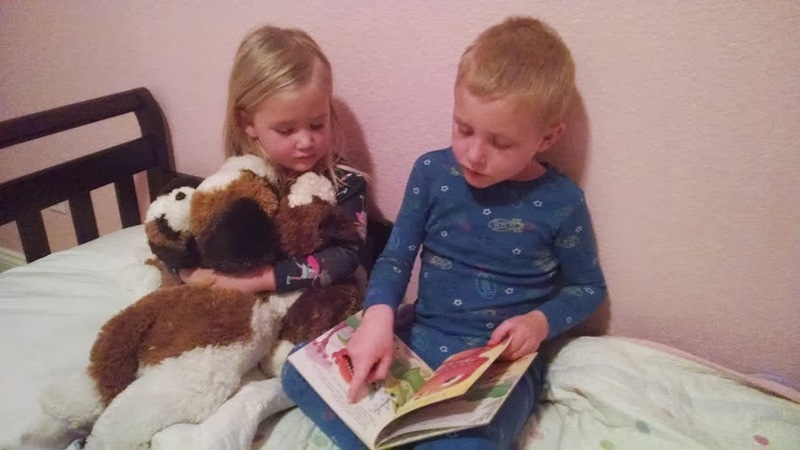 Here's a quick picture I snapped of my kids reading Buddy’s Teeth together. They loved the book and were completely fascinated learning about T.Rex teeth. It gave us a good opportunity to talk about how our teeth are different. After reading Buddy's Teeth, we decided to do a little activity inspired by the book. 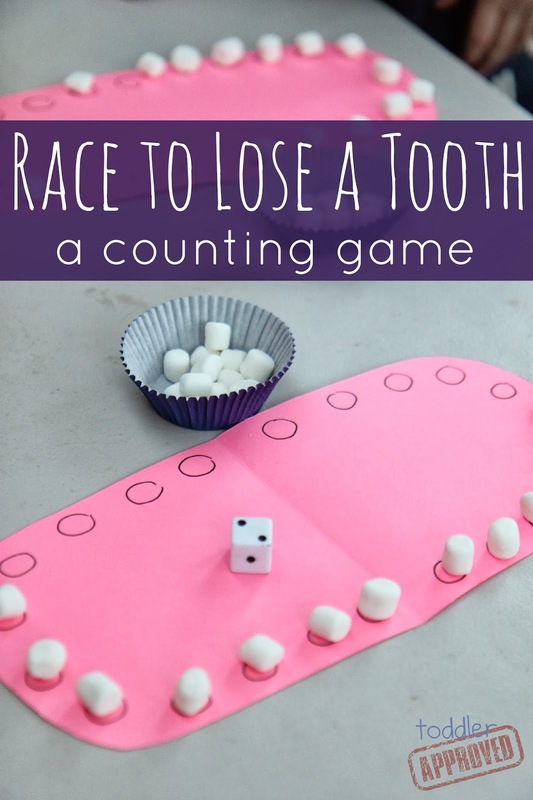 We created a simple counting game called Race to Lose a Tooth. Materials Needed: mini marshmallows, muffin tins or cups, 2 pieces of pink paper, scissors, a die, and a black marker. It might seem a bit silly to be using marshmallows in an activity when we are talking about oral health... but I could not for the life of me think of a better thing to use for this activity. If I had little white erasers I would've preferred that... so will need to go searching for some. Fold your two pink papers in half and cut it to look like two open mouths (one for each player)... just like your mouth will look when you have it wide open at the dentist. Then draw several little circles around the edges of the papers to serve as spots for teeth. You can draw a lot of circles... or only have a few (depending on the ages of kids you are working with). Put several marshmallows in a muffin tin liner, grab a die and you are ready to play! 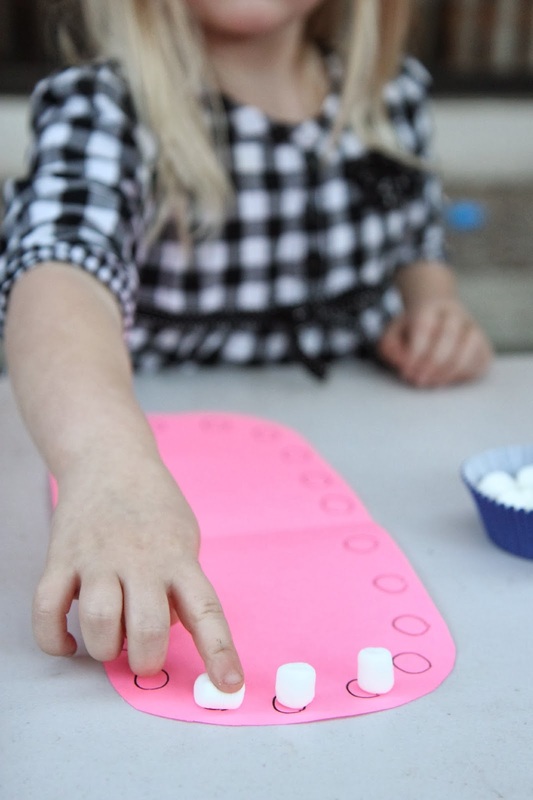 To start off the game the kids need to place a marshmallow on each circle so that each player starts with a full mouth of marshmallow "teeth." Once each mouth is full of teeth, players take turns rolling the die. Whatever number one child rolls is how many teeth he "loses." He then has to remove that many teeth from his board and put them back in the muffin tin liner. Then the next player rolls and does the same thing. Players race to see who can get rid of their teeth the fastest! As players get closer to having all their teeth gone they need to roll an exact number to lose all of them. For example, if a player has 3 teeth left, he needs to roll a 3 to get out... or he needs to roll a 2 followed by a 1 to get out... he can't just roll a 5 and take 3 off the board. The player to have a blank board FIRST is the winner. This game can also easily be played by just having kids roll the die and take away teeth without any competitive component... if they don't like that sort of thing. My kids do... so they loved this. The kids practiced reading numbers on a die, counting marshmallows, and my older son even worked on a little subtraction. We played the game several times and I did let the kids eat a marshmallow or two (or sometimes a handful) between rounds. 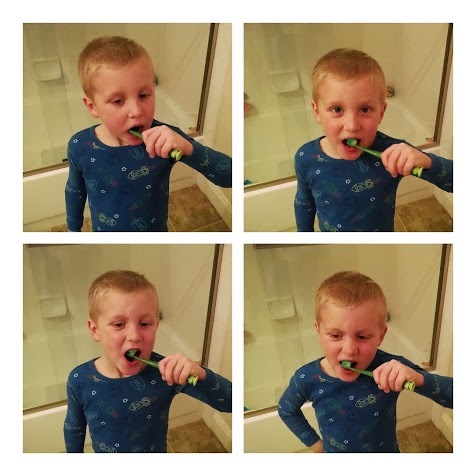 This gave us a great reason to go and use our new Dinosaur Train toothbrushes by GUM®! After we played, we brushed our teeth and we watched the rest of Dinosaur Train. 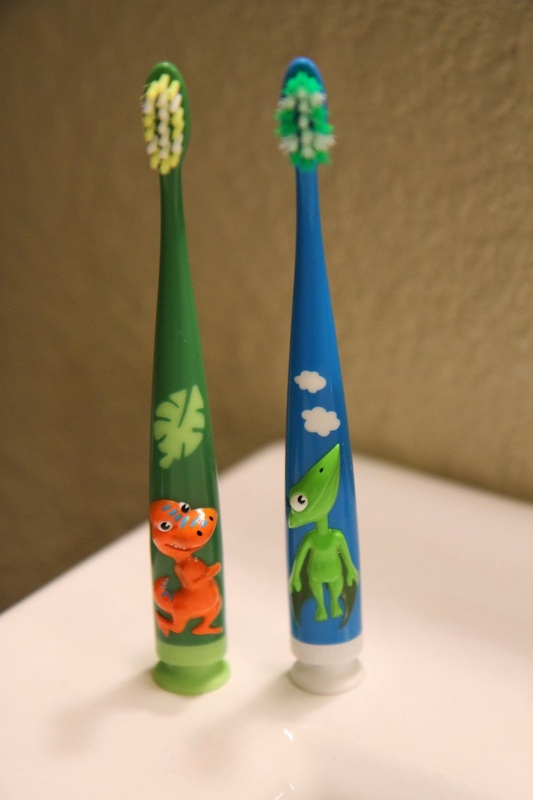 We liked the Dinosaur Train themed GUM® twin pack toothbrush set because 1) they have dinosaurs on them and 2) because they have a sticky base that makes them super easy to stand up next to the sink. The colors were perfect for my kids too... since they both like blue and green, so there was no fighting over who got which brush. Hooray! 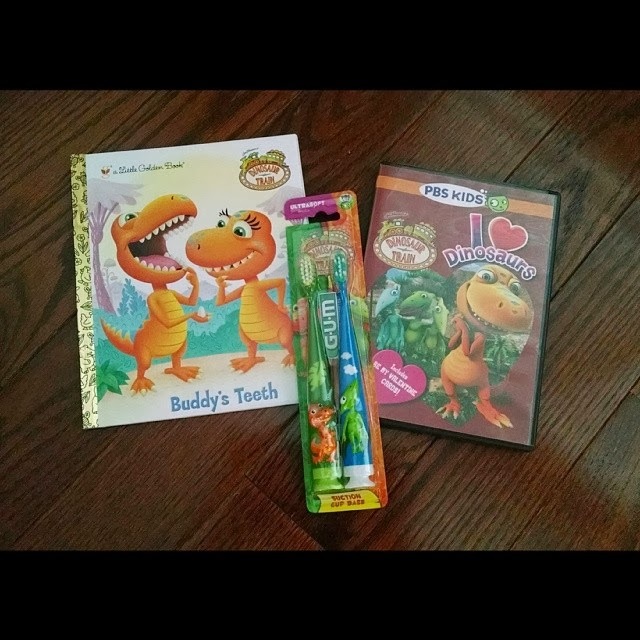 In addition to having a fun time with our cool Dinosaur Train package, we had a great family discussion about oral health. You can click here to download your very own Dinosaur Train Teeth Tips Poster. 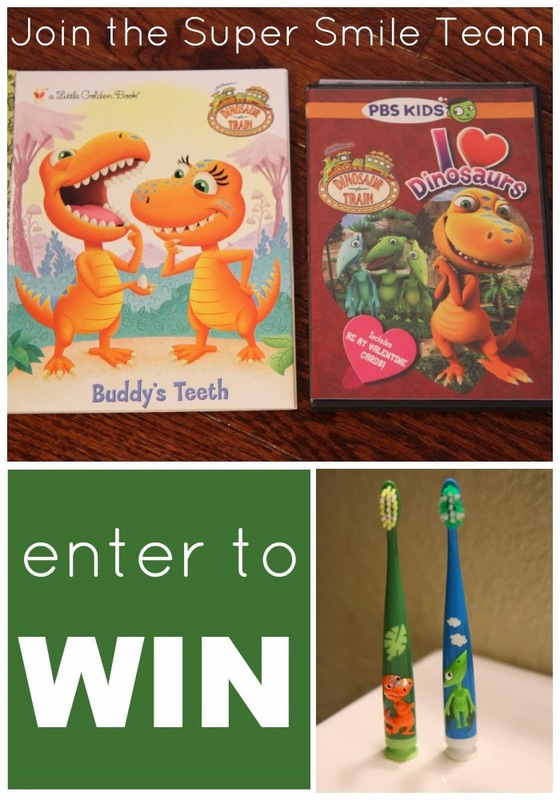 I am so excited that in celebration of National Children's Dental Health Month we get to give away a Dinosaur gift package to one Toddler Approved reader! You can receive up to 8 entries by completing all of the tasks mentioned in the rafflecopter below. The winning entry will be drawn on Saturday, February 22nd. I will notify the winner via email. Disclosure: The Jim Hensen Company provided the giveaway items for free for Toddler Approved readers and for us to review. Thank you! We appreciate the sponsors of this giveaway, so if you have a sec to say thank you or give a quick follow to these awesome companies, we'd love it. These are great ideas. I'm going to use them with a class of special needs toddlers and preschoolers. These are great ideas. I'm going to use them with a group of special needs toddlers/preschoolers. What about using cotton balls? These ideas seem great to use with my preschoolers and also my special needs students! I'm working them into my lessons immediately. You could use white unifix cubes! Dry white beans would work, too. Dental care must be taught early from childhood parents must guide the children and taught them the importance of dental care. also a regular visit at the doctor will also help kids understand the value of dental health. What a really fun way to get kids interested in dental health. Being a dentist I love to see anything that teaches them young the importance to oral hygiene.